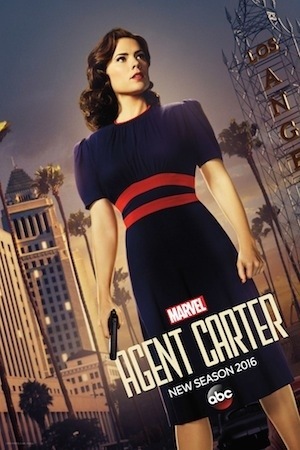 Thoughts on Season 2 of Marvel’s AGENT CARTER! Better Baddies. This season did improve on the bad guy end from season one, while bringing its strongest baddie from season one, the unhinged assassin Dottie, with it. Whitney Frost was quite a fascinating villain, almost an evil fictional version of real life actress/genius Hedy Lamarr. That she ends up being easily dealt with by the season finale seems a bit of a letdown, but I remember her more than season 1’s baddie. Certainly the Council could have been beefed up in terms of being a threat, but they don’t seem to be done with, especially with Jack discovering that key and being shot (dead?) in the last scene of the season. Stronger Supporting Cast. While last season wasn’t lacking in interesting supporting players, the change of venue brought in some more varied people to play off. We finally got to meet Mrs. Jarvis, and was it hard not to see why Edwin would hold onto someone that awesome. Then you got new faces in the SSR, like Rose and the scientist no one remembers, and briefly returning ones like ol’ Howard Stark. In this area, season two was a considerable improvement. Jarvis! Peggy’s platonic friend and Stark butler is always fun, and he gets a bit more fleshing out here. Besides the brief look into his past and crisis with the pivotal wounding of Mrs. Jarvis, he’s been shown to be more than just comic relief. But, I’m not suggesting he is lacking in great comedic moments, because he has some amazing moments of sardonic wit and physical comedy that were stand-out moments. “Jarvelous”, indeed! Fun, Fun, Fun. While I appreciate the occasionally soap opera-esque turns of comic book television, Agent Carter has been surprising me with how fun it is. And by that, I mean broadly comedic in a way that makes watching a breeze. It was almost a fluke that a show about a lady spy in the 1940’s got even onto network television, but the cast and crew are clearly having a blast with it. I mean, there was no real reason to have a musical number dream sequence during a particularly tense hour, but they did it, and it was spectacular! 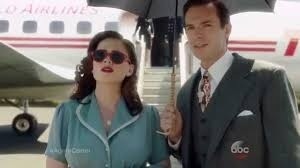 So now that the season is over, what’s next for Agent Peggy Carter and the rest of the SSR? It’s hard to say because of the low ratings this season and the lack of renew or cancellation notice at this time, but I would hope that at worst, we get some kind of conclusion to some of the plotlines left open in the season finale. Like, who shot Jack for that file on Peggy’s brother and will Peggy/Souza last? Also, that flamingo in Stark’s house? What will become of it?